Perhaps you have think of gathered all the supplies you can think of and are ready to bug out to the woods in order to survive a SHTF event or natural disaster. But there’s likely one thing you may not have taken into consideration during a SHTF or natural disaster event. Wild animals that you may encounter in the wilderness or even along the roadway can really hinder your ability to survive. A SHTF event is chaotic and scary for humans but it can be even more terrifying for wild animals. Even the most timid of animals can be dangerous for you when they feel scared or cornered. Many wild animals may be forced out of their comfort zone when SHTF, and this makes them more dangerous than ever for you. Animals that would otherwise be simply a nuisance, such as raccoons, flies, or mosquitoes can spell disaster if they devour your food supply or carry disease to your hideaway. Knowing what to do when you cross paths with a wild animal, could be the difference between being injured and walking away unharmed. With that in mind, here are the critters to watch out for in the wilderness. Most predator animals aren’t really looking to take on a human. During normal times, an encounter with one of these predators will be rare because they’re out there looking for prey that is lower on the food chain than they are. They are primarily motivated to kill by hunger, but it’s important to know that many predators may attack a person if they feel trapped or threatened. During a SHTF event or natural disaster, most wild and even domestic animals will be scared and pushed out of their comfort zone. Under these circumstances, encounters with predator animals could be more likely. It will of course depend on which region you are in, but below are some of the predator critters to watch out for in the wilderness and some notes as to the best steps to take if you encounter one. What to Do: The best thing strategy of course is to avoid an encounter with a predator animal if at all possible. Keep a fire near your campsite at night, travel in groups, watch for tracks or other signs predators are in the area and make enough noise that the predator animal hears you coming and goes the other way before you even see it. In most cases, you do NOT want to try to run away from a predator animal. They are used to chasing their food so running from them is likely to frame you as prey in their mind. When possible, stand your ground with a predator, avoid direct eye contact, and make yourself look as large as possible. The goal is to make the animal believe you are a threat and NOT prey. Stop and stand still. Talk to the animal firmly in a low voice, do what you can to seem larger than you are and then back away slowly. Not all of the critters to watch out for in the wilderness are ones that can cause serious physical injury to humans. Many of the critters that we normally wouldn’t think twice about during regular times, could become a threat during a SHTF event or natural disaster however. It’s frustrating when racoons or opossum get into our garbage can and knock it over but most days it’s an inconvenience, not a threat. But, in the wilderness, where you are relying on your limited food stores to get you through a set period of time, a racoon or opossum can be a threat to your survival. If you don’t take the proper precautions to store your food securely, some animals can and will get into it and devour it all, leaving you in a dire situation. Other rodents and insects, such as squirrels, ants, and flies, while they may not devour your entire food supply, can introduce disease to your food by urinating, landing on, or tearing open sealed packages. What to Do: Always make sure that food at your campsite or other location is stored away securely at night and any time your campsite will be unattended for any period of time. Store food in coolers with tight fitting lids or in your vehicle whenever possible. Get in the habit of doing a check of your campsite every night before bed to make sure every bit of food has been stored away. Dispose of garbage in a can with a tight fitting or locking lid. There are also other creatures both large and small that you’ll need to watch out for in the wilderness. Some are rarer than others and will depend on the area where you live. But keep in mind that while some of these animals may be rarely encountered during normal times, all bets are off during a SHTF event or natural disaster. Although moose and elk and even deer may not seem like a threat, they can certainly be dangerous, especially during mating season or in a SHTF or natural disaster where they feel threatened or cornered. These animals are powerful and can do serious damage with a swing of their antlers or a kick from their powerful hooves. What to Do: Don’t approach a moose or elk calf. Where there is a baby, there is a mama with a protective nature. Move out of the way of male moose, elk, or deer if possible and continue on your way slowly. Watch for a lowered head, raised hair, or a moose that stops eating. These can be signals they are going to attack. If one chases you, climb a tree if possible or get on top of something. One of the critters to watch out for in the wilderness, specifically in the southern states and the Midwestern United States is a feral hog. These basically look like an overgrown, hairy version of the domesticated pig that you may be more familiar with. But these hogs can be dangerous, especially if they are protecting young ones. What to Do: If you encounter one of these feral hogs or wild boar, do not run. If you aren’t familiar with hunting these animals, don’t try to use a weapon against them, they are very thick skinned, and a failed attempt to harm them will only make them more aggressive. If possible step behind a tree or bush so that you are out of sight and wait for them to move on. If they charge at you, climb the tree or get on top of something. Depending on the area you live in, another of the critters to watch out for in the wilderness are snakes. Most snakes will try to avoid you if they can hear you coming. Not all snakes are poisonous but many of them will bite if they are cornered or you get too close. Even a non-venomous snake bite can be a serious medical situation and even fatal if not properly treated. f you live in an area that is known for venomous snakes, make sure you carry anti-venom if possible or know how to get help quickly. What to Do: The best thing to do is to always be aware of your surroundings and do your best to avoid snakes if at all possible. Take the time to learn to identify the snakes in your immediate area and how to determine a venomous snake from a non venomous one. If you do cross paths with a snake, the course of action is to simply leave it alone. Snakes won’t pursue humans and in most cases they won’t bite or strike unless they feel threatened. Water moccasins are one exception to the rule and can be particularly aggressive so move away quickly. Most of us are used to dealing with the occasional bee, wasp, or hornet that gets into the house. Other than the risk of getting a painful sting, there isn’t much danger. But some of the critters to watch out for in the wilderness are wasps, hornets, and bees. In the wilderness, where there are fewer humans, it’s not uncommon to find huge nests on trees or in the ground. If you hit or step into one of these nests, you could be in for a world of hurt and even death from multiple stings. What to Do: First and foremost, like with most other critters, try to avoid a confrontation with these flying pests. Pay attention to where you are walking and keep your eyes peeled for nests which could be in the ground under your feet or above your head in the trees. If you accidentally step in or otherwise disturb a nest, avoid yelling and flailing or swatting at bees and run away quickly. For hornets and wasps, it’s important to stay calm. Do not run or flail around as they can sense movement. Cover your face and eyes and with your head down, walk away from the area slowly. If you are stung, remove any stinger still in your skin by scraping across it with a credit card edge or your fingernail. You can apply a baking soda paste to help draw out a stinger as well. Ice will reduce swelling and help with pain. A Q-tip dipped in bleach and applied to the area will stop the pain instantly and will prevent the itching that usually follows. Always wear shoes and long pants in the woods and carry an epipen if you are allergic or are unsure if you are allergic to bees, hornets, or wasps. 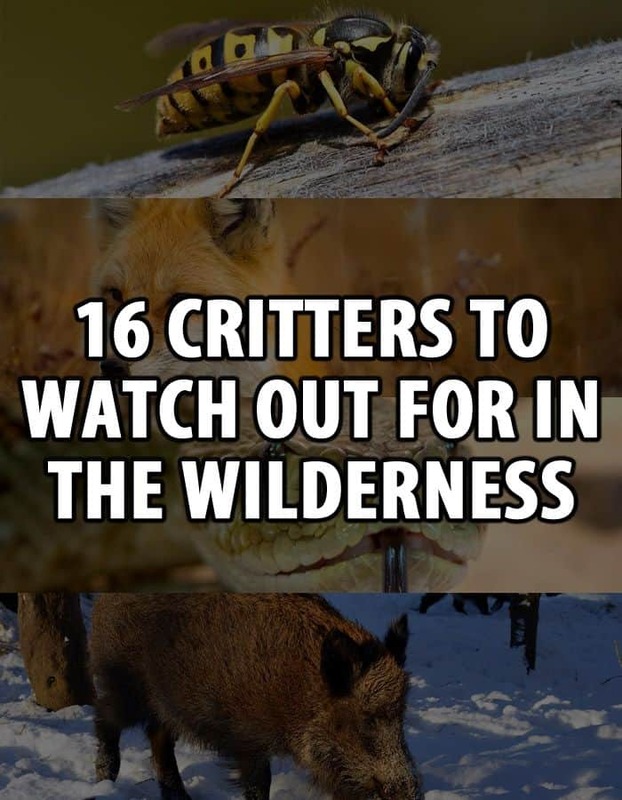 So those are the 17 critters to watch out for in the wilderness. Did we miss an obvious critter that you’ll be watching out for the next time you venture into the woods? Have you had an encounter with any of the critters above? Share with us in the comments below and tell us what you did when confronted with one of these critters. place where lions tigers and bears will get you. We country boys aren’t scared a whit. As far as dealing with predators all you listed can be zapped with a handgun . It is good that this article was posted because many people never really think about the risks when they must be away from fairly well-inhabited areas. One does not have to be in true wilderness to run into many of the animals listed. I would like to make a clarification, if I may. The article appears to be focused on North America. If this is the case three of the first group of six listed are actually the same species of animal. Simply called by different common names in different areas. The mountain lion, cougar, and panther of North America is the same animal. The other big cat in the western hemisphere is the jaguar in South America. The black panther often spoken of is a melanistic color variation of the jaguar, not a separate species. However, I would like to add some potentially dangerous animals to the list. 1) Javelina/peccary. Mostly in areas of the US southwest and down into Mexico and Central America. Though they look like small pigs, they are not in the same family as pigs. And they do act somewhat similar. Many might not consider them a danger as they are much smaller in general that feral pigs. Still, some of the largest boars can be upwards of 75 pounds or more. And they do have sharp tusks and sharp hoofs. And they are social animals so are usually found in groups of four or five to fifteen or twenty. As males are hierarchical in the group, not loners, there will be several animals more than willing to protect the rest. As with almost all animals, a female javelina with you will be the most aggressive of all. And believe me, though small, they have very sharp teeth and the hooves can be sharp, especially if they are in a rocky environment. If not come upon suddenly or wind up trapped, they will usually be long gone when you get to where they were. But if not, be prepared to fend them off and/or protect yourself from them. Not only might there be any of several diseases that can be transmitted to humans, but they also tend to have fleas, which is just another problem. They are good to eat, though. 2) American Bison, usually just called buffalo. Mostly in and around Yellowstone Park, but occasionally found in other areas out west in the US. If you want to know what these animals can do, just watch a video or two about the attacks that take place in the park. They look like slow lumbering creatures. And will often come right up to a vehicle and walk on by. If a person is outside of that vehicle the situation can become very different very quickly. Not to mention a single cow with a calf is a danger all its own. They can and will charge, use their horns and their hoofs and body to gore, trample, and stomp a person. A person will be very lucky if they are attacked in such way. Sometimes they will do some damage to just give a warning, but just some damage from a buff is enough to put you in a hospital for a while. Assuming there are any hospitals. Treat American Bison with the same respect you give actual predators. A buffalo is not going to eat you, but you would still be dead. Like several other animals on the list, bison can look slow and rather lovable, so children are often drawn to them. If you are anywhere near buffalo country, keep an extremely close eye on children, to the point of not letting them out of your sight. 3) Deer. All species and varieties. While not as large as moose and elk, they will still attack if startled or trapped. If they wind up in a situation which is not familiar to them, such as wandering into a back yard or even camp with tents and picnic tables, they can very often panic and start running, more or less randomly it looks like at times, trying to get away. If there is not a very obvious open path right in front of them, they can go any direction, and will attempt, and often succeed in going over or through things up to seven or eight feet tall, including wooden fences. Chain link and other wire fences they will often try to run through, and when they do not make it, they will attempt to jump over them. Be in the way of one in a panic, and it will go right over you. The hooves are sharp on all of them, and when a deer has antlers past the velvet stage, they can and will use them with every bit of effectiveness as a trained fighting bull in a ring in Spain. Traveling through a forest and even some meadows at the right times of the year, you can walk right up onto a fawn, and even sometimes a full grown deer. If there is no indication you have seen them, and you came up in a situation where they are not aware of you until you are close, the does and younger does and bucks will usually just stay down quietly. But get to a point and they literally explode up, and whatever direction they happen to be facing is where they will head. And that will often be toward whatever came up on them as they tend to bed down in pretty confined areas. Do not take deer lightly. Not even the smaller varieties back east. An 80 pound deer with antlers can do a number on you, and due to many movies and TV shows, children are often not nearly cautious enough if they see one, even if it is charging right toward them. 4) Wolverines and badgers. Though wolverines are predominately further north in the US they can be a deadly adversary if you wind up in the area. Not to mention, like badgers and raccoons, they are curious, and always hungry, especially for salt, they will invade a camp and can sometimes get into cabins if not kept carefully locked up. And they can be vicious if cornered or they feel trapped. They are low to the ground but fast with sharp teeth and claws on their paws. Be very, very careful in wolverine country. Badgers are not nearly as bad, but like raccoons and opossums, you do not want to mess with them. Or leave your supplies vulnerable. With all of the animals in this grouping of primarily nuisance animals, it is not just human food they will go after. Leather products, often anything with any salt on it from human touch, such as ax and shovel handles, if wood, can be gnawed on to the point of destruction. Be aware. 5) This is a group, as opposed to a single species or type of animal. I am talking about feral animals of all types. If the situation becomes prolonged to much degree, there will be many domestic animals turned loosed, abandoned, that escape, or simply have lost their human companions and start to survive on their own. Dogs will usually form packs. Until they get to the point that they are shaggy and wild looking, they will look like what they started out as. Someone’s pet. So it is tempting to approach them, especially by children. If they have already started to lose their bonds with humans, due to being attacked by humans that have run them off or shot at them already, or if they have tasted human flesh in events where there are dead bodies available and no regular dog food put out for them, they will attack a child just like a coyote or any other predator. While most breeds of dogs, over the millennia they been domesticated and lived with humans, there is a natural tendency to want to be with humans. However, starvation, injury, fear, and pressure to feed their young can quickly overcome that reluctance to harm humans where they would ordinarily protect them. Especially children. During the time they still look like a pet rather than a wild animal, and that drive to be near humans, feral dogs can and will often come close to humans, and then, when that hunger hits, the reluctance to attack is gone, since they now have a great opportunity. Once wild and in packs, consider and treat them like coyotes, only slower, and not quite as fast or savvy. I do not want to put it all on dogs, though. Feral cats, though usually not likely to out and out attack a human, even a child, they have a remarkable ability to cause humans a great deal of grief when feral. Even cats that have homes now, and are fed and watered, groomed, and taken care of by loving families, if allowed to roam on their own at times, especially at night, are usually the animal that is getting into trash cans, turning them over, knocking off the lids, and caterwauling at night in many communities, not stray dogs. In a disaster situation, those cats will be the first to go feral if they lose their human attendants. They already have some of the skills. The rest that wind up surviving the early stages, as in not being killed and eaten by the local dogs, or killed by the existing population of feral Tomcats that always seem to be in an inhabited are. Tomcats kill. They breed but often kill the offspring if they can get to them. And they kill any other male cat that comes within their territory. Including females that cannot breed. Again, as I said, they are not likely to attack a human, but if a baby was not being watched closely, and an injured Tomcat, or starving one for any reason, might just try. But the main thing is the fleas they will have, and the diseases they will probably carry, including rabies. They are just as likely, and often more likely, to have rabies than feral dogs because they are a bit more susceptible to being attacked and bitten by the wild animals that carry the disease now, once they begin to interact with them. Anything that a cat will eat, and that is many more things once they go feral than it might be under normal circumstances when they can finangle their human to get them something else, food left vulnerable can be snatched by a cat and the food and the cat gone in just seconds. Just an FYI here: I have seen squirrels, both tree and ground, do that same thing in campgrounds. Usually, a piece of fruit or similar They might skitter around a few times, coming close but dodging away if any movement is made toward them. But once they zero in on whatever it is, unless that item is taken out of their sight and ability to get to, they will go after it at some point. After dozens of approaches and retreats, if you are not, or your dog is not, there to stop it, a squirrel will finally get close enough, and when not chased or scared off, will make that last mad dash, grab the food, and take off running. I have seen a ground squirrel that would easily fit in the palm of my hand, do this very thing, taking an apple that had to weigh three or four times what the squirrel did. It was after many trips through our camp, with detours toward the picnic table each time, approaching from all different directions and angles. I was right there watching it, within five feet of the picnic table. I dozed, no more than ten seconds, and when I opened my eyes, there was the ground squirrel, working its teeth into the apple holding it still with its front paws. When it saw me lift my head, it crunched down and took off. It could not lift the apple up and run, but it kept it in front of it and got out of there faster than you can imagine. The point of me mentioning this is that had that been a predator, that could harm a person, especially a small child, it could happen exactly the same way, with a child or baby taken, rather than an apple. Ten seconds. That is pretty much it for the additional animals. A couple more points, though. It is extremely difficult and in some places illegal to acquire antivenom for human use. Not to mention, even what is available for animals is often in the range of $400 or more for a 10ml vial. And it can take ten, or twenty, or even more vials to treat a venomous snakebite in a human. While if I could get it, I probably would. But a single vial is not likely to do much good. Though at least one antivenom is available for the common snakes in the US, most rattlers, water moccasins/cotton mouth (another case of different names for same species), and copperheads, but not for coral snakes, it is not an absolute guarantee that it will work on any given patient. Plus there is the issue of allergic reactions. Even with a careful test prior to an injection, it will be difficult to wait an adequate time before administering the antivenom to someone that a person loves dearly that is at such risk and usually in great pain. Most bites by poisonous snake do not envenomate. Still does not matter. Even with $4,000 to $8,000 worth of probably illegal antivenom, which only has a shelf life of about 5 years in its dried form and must be replaced regularly, the risk is still extremely high that the victim will not make it. Again, if I could, I would probably try. But here the point is, under no circumstances let even the presence of antivenom distract or divert you from taking the utmost precautions to avoid all snake bites, especially those that might be poisonous. The same goes for insect and spider bites and stings. You can have all the epi-pens you can afford and can get your hands on. If there are no medical care facilities around, the chances of survival of a serious anaphylactic shock allergic reaction are not very good. Avoid, avoid, avoid. They are just like a snake under a person’s house. You either get rid of it, or it will bite someone eventually. If there is an at-risk person that that could die from stings or bites, every effort should be made to get rid of any of the creatures in the area that are a danger. And the person should be trained on what to do if they come across one of them, in terms of how to react and to act to get away safely before any incidents occur. With the insects, I would strongly recommend everyone have a decent no-see-um headnet available, on their person, if there is any likely risk of running into bees, hornets, wasps and the such. At least protecting the face, an extremely vulnerable area, might reduce the likelihood of enough stings being made to put a person into a deadly reaction. No guarantees. Ah. Do not forget fire ants in their ranges. I have seen balls and carpets of them floating on flood waters. Another note about some events. It does not necessarily have to be a catastrophic event to put people at risk from wild animals. Floods will drive animals, snakes, birds, and other nasty things up and onto any dry surface they can find. Be ready to fend these animals off if you are in a flood and have even a couple of square feet on which to stand. You are likely to have company. One last word, which I probably should not bring up as it is very, very far-fetched. But it has happened a couple of times in recent years to my knowledge. Be aware of any animal parks, zoos, and private wild animal collections in your area or areas you may be inclinde to travel to in case of problems. And keep an eye out for entertainment news for any circuses that might be even just travelling in your your area or areas of interest. Exotic animals, including dangerous predators, and just as dangerous large animals, have escaped from zoos and circuses. In a major event there is no telling what the owners of these animals might do if they thought they could not care for them. Just a word to be aware. Everything in this reply is just my opinion. Also keep in mind animals that might carry rabies. Raccoon , skunks, and squirrels, for example. Watch for Yellow Jacket Hornet nests in the ground. These hornets will build nests in old animal dens and tunnels. Look for hornets circling close to the ground and don’t allow your shadow to pass over the hole! This signals the hornets to come out and sting anything new in the area of the hole. I escaped a swarm of yellow jackets by stripping off my shirt as I ran. The hornets ignored me and continued to sting the shirt. A Yellow Jacket sting isn’t too bad but ten or twenty at once will cause you to hate life! I have packed in my BOB the locsak bags that are odor free. You can put your food in them and no animals can smell the food. The Coral Snake, both the eastern and the Western, are them most deadly, drop for drop. My sister was a nurse in Ft. Meyers,Fla. some years ago, and one month before she started, a man was released after being bitten by “a pretty red, black, and yellow” snake. It was a Coral snake, he lost his finger, was in intensive care for “a while”, and the bills to keep him alive totaled $300,000 ! There is a mimic of the Coral snake, but the color banding is not in the same pattern “Red next to yellow kills a fellow; Black next to yellow is a friend of Jack”. But all snakes have an seemingly unlimited number of different bacteria and germs in their mouths, and septicemia (blood poisoning) will kill you if left untreated. Bull snakes have a particularly nasty temper, and though non-venomous, are best left alone. Garter snakes are classified as Venomous Nonvenomous snakes, as their saliva is antagonistic to some people.